Can digital tech make work at height safer? From nerve-janglingly realistic virtual reality to automated scaffold compliance checking and experiments in BIM, software innovations are changing the planning of working at height in construction – with significant safety implications. 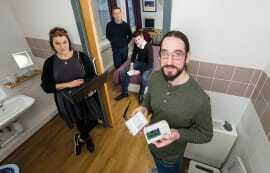 Stephen Cousins reports. 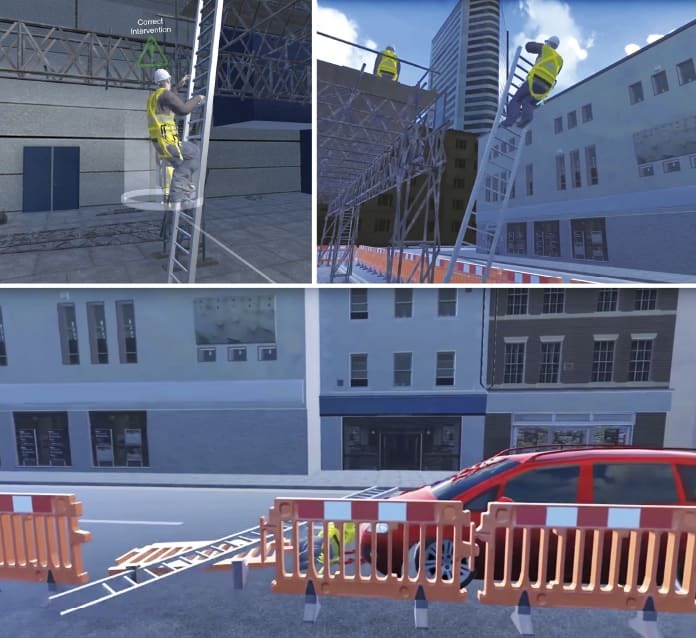 When scaffolding and access company GKR Scaffolding decided to roll out virtual reality training to its workforce, a key objective was to engrain safe behaviour by exposing them to high-risk situations impossible to simulate in the real world. But no one anticipated the powerful psychological effects many operatives would experience as they witnessed hazardous working at height situations play out in front of them in an ultra-realistic immersive 3D world. In one training scenario simulated in the system, a worker neglects to secure a ladder to a scaffold and subsequently falls into the road outside an exclusion zone and gets hit by a car. Operatives, wearing a Samsung Gear VR headset and earphones, see the man fall, watch the ambulance approach, hear the sirens wail, and must then listen to an emotional phone call to the man’s wife after he is pronounced dead. VR training is one of a number of innovative software technologies being deployed on construction projects to improve the safety of work at height, as well as to streamline the design, planning and monitoring of work. Scaffolders are taking the first steps into the world of building information modelling (BIM), sharing intelligent 3D models and exploring the benefits of 4D animation to plan erection sequences. Meanwhile, new software and smartphone apps make it possible to conveniently and accurately check the compliance of scaffold designs, carry out inspections on site, and identify worrying trends. Work at height remains one of the highest risk jobs in the UK. In 2016-17 it was the second biggest killer, responsible for 25 fatal accidents. The Work at Height Regulations (2005) require duty holders, such as main contractors, to ensure that workers are competent and trained in the relevant system of work and related equipment. The VR set-up deployed by GKR Scaffolding is intended to reinforce its existing safety training and to help employees understand how catastrophic and severe incidents can result from poor planning and work practices. It is hoped that by exposing operatives to real consequences in an immersive environment, their perception and awareness of risk is heightened, thereby increasing safety awareness and hazard identification, and bringing about behavioural change. 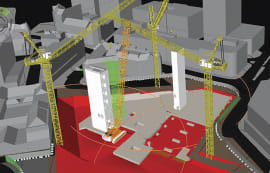 VR training specialist eLearning Studios helped develop the three modules which cover safety concerns at three different heights on a high-rise building, starting at ground level. “Counter-intuitively, erection of the lower gantry is where most incidents and near misses tend to occur because operatives are more complacent and lack the caution that comes into play when working 40-50 floors up where there are very few incidents,” says Gawor. 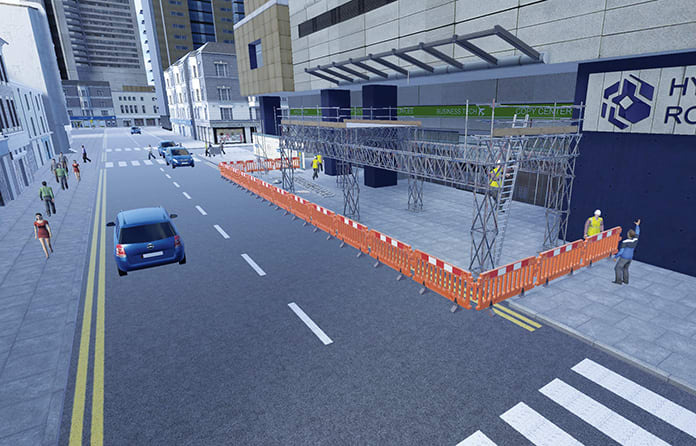 3D visuals are generated based on accurate BIM models of scaffolding produced in Revit, while an inbuilt physics engine can realistically simulate the effect of accidentally dropping a tool or scaffolding tube from height. Another company exploring the benefits of VR training is powered access hirer Nationwide Platforms, which has just revealed details of the first large-scale deployment of a hybrid VR system designed to boost the safety of road workers repairing the M5 Oldbury viaduct. The Highways England scheme will see a joint venture of BAM Nuttall, Morgan Sindall and VolkerFitzpatrick replace 2.3km of drainage under the viaduct and install formwork and shuttering required for more than 5,000 concrete repairs. 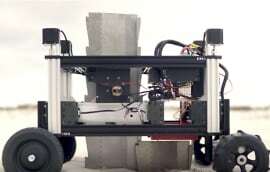 The simulator units, created by Canadian VR developer Serious Labs, combine a replica platform basket and control panel with a full-motion-tracking VR headset, to mimic the sensation of operating real boom and scissor lifts in a range of applications, including different ground conditions, restricted access, overhead hazards and loading and unloading. The system allows trainers to provide live feedback on operator skills and behaviour to encourage safer operation. BIM processes and technology have gained widespread use among architects, structural engineers, and main contractors, but there has been limited impact to date on specialist subcontractors, including temporary works contractors that install scaffolding, props, falsework and formwork. A key issue is different interpretations of BIM requirements, and related software, among main contractors, which can make it difficult for SMEs to throw their hat behind a single system. The drive to bring projects to site can also preclude SMEs’ involvement in early design, says Garry Fannon, head of BIM at Willmott Dixon. 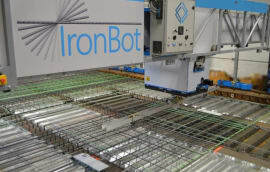 However, there are signs that interest in BIM is increasing in the supply chain, with some firms seeing the technology as a means to differentiate themselves from the competition. Civil and structural engineering software developer CADS says it has received more enquiries in recent weeks from scaffolders interested in BIM functionality within its new design software Smart Scaffolder. The platform includes a BIM Toolbox module that enables users to build an accurate 3D scaffold model for a project, then export the file in open standard Industry Foundation Class (IFC) format for use in any BIM authoring software, including Revit. 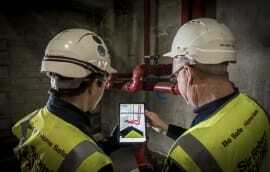 The latter process, known as 4D BIM, offers many potential benefits when planning work at height, says Fannon. Also innovating in response to the industry-wide drive towards BIM is scaffolding supplier Layher, whose software LayPlan OEM makes it possible to generate accurate 3D models and animations of scaffold designs. Designed for use with the company's modular scaffolding system, the tool makes it possible to transform regular designs produced in the sister product LayPlan Classic into detailed 3D models that can be viewed as realistic static 3D renders or as walkthrough animations. The inherent risks of work at height may drive the deeper integration of temporary works into BIM following the introduction of the BIM Level 2 specification PAS1192-6 earlier this year. The specification sets out requirements for the collaborative sharing and use of structured health and safety information and emphasises the need to identify and share “foreseeable risk” across teams much earlier on and throughout a project’s life cycle. This makes a strong case for bringing safety-critical activities such as falsework and scaffolding design into BIM much earlier than at present. “We should be using the model to highlight areas of high risk, for example a birdcage scaffold being erected inside an atrium. Exclamation mark symbols can be added in to highlight a high-risk element of work that requires a specific method statement,” says Fannon. Structural design calculations for scaffolds are critical to substantiate loadings, stability and rigidity, a process that was made simpler last year with the launch of the TG20:13 eGuide for tube and fitting scaffolding. The eGuide, for PC, Mac and tablet devices (an Android version was launched last month) makes it possible to check that designs for standard scaffolds comply with good practice set out in the TG20:13 guidance by the National Access & Scaffolding Confederation (NASC). 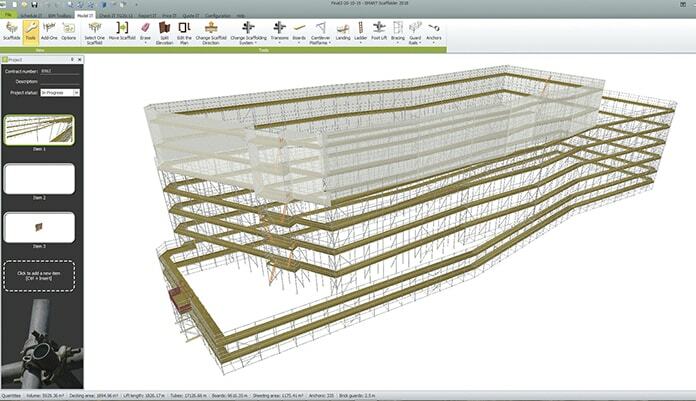 An “enhanced” version is integrated into CADS’ Smart Estimator tool (pictured above – part of the Smart Scaffolder suite), which can automatically verify the compliance of all scaffolds across a 3D project model. If a non-standard design is found, such as structural scaffolding, shoring for demolition or a large cantilever, it is flagged up, ready for a temporary works engineer to develop a bespoke design. 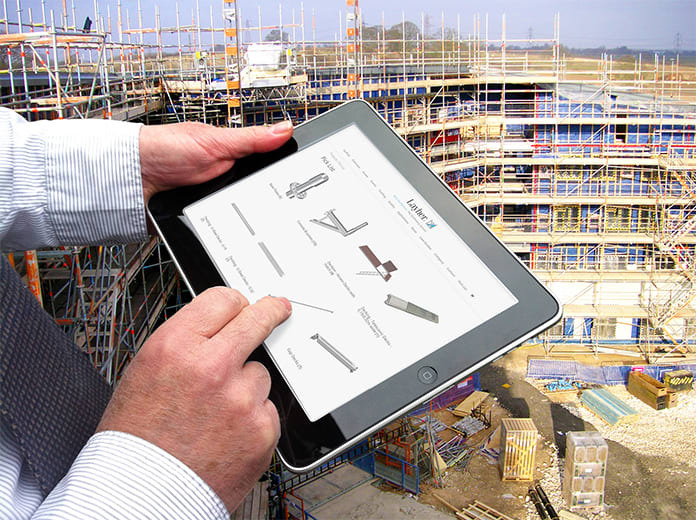 Apps are also making the lives of site managers responsible for weekly scaffold inspections easier by driving out the need to file paperwork, which can be a burden on complex sites with hundreds of small scaffolds. The Smart Inspector app helps users manage the inspection process, using drop-down menus to record faults, attach photos and videos, then track any issues to ensure they have been corrected and reinspected. “Main contractors can log into the system and access the inspection history to identify any recurring issues that may need addressing, perhaps resulting in the need for toolbox talks for the workforce,” says Roberts. Such improved oversight could prove critical in reducing the disproportionate number of injuries and fatalities associated with work at height.